We set out aboard the fishing boat Western Isles for a sail to the head of the Loch of Heaven, which is the English translation of Loch Nevis. Perhaps it is so named because the lowness of the hills on its south retaining wall allows the north slopes to get all the sun that’s going, unlike dark Loch Hourn to the north which in translation is the Loch of Hell. 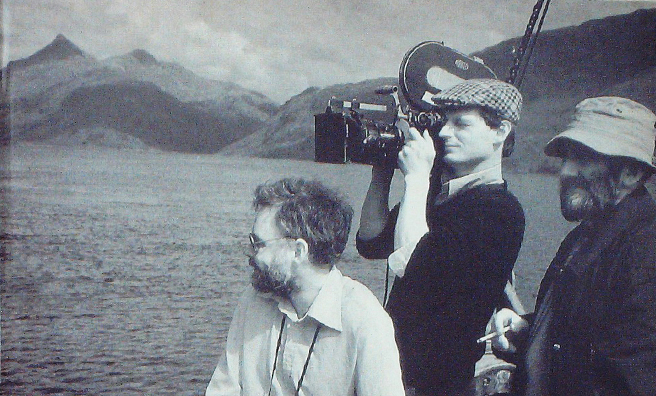 Our purpose was to capture on film the wide mouth open to the Point of Sleat where the Old Chief of MacKinnon brought Bonnie Prince Charlie on July 5th, 1746 at 4 o’clock in the morning in a rowing boat from Elgol. 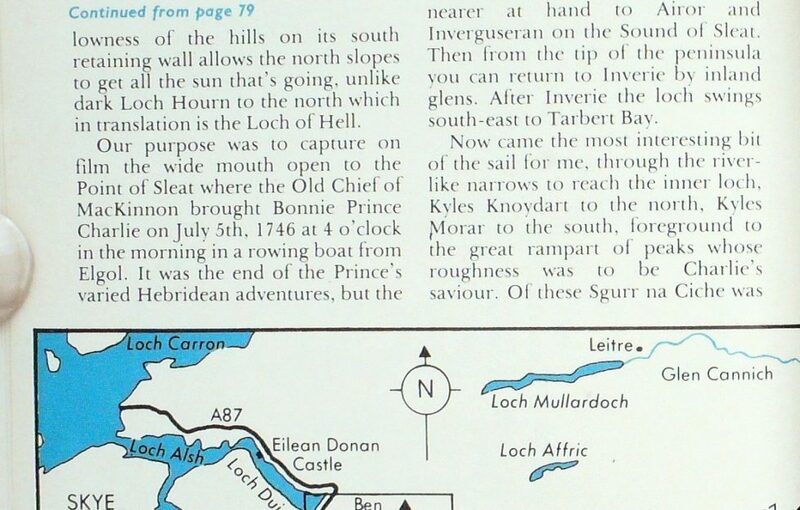 It was the end of the Prince’s varied Hebridean adventures, but the beginning of more difficult trials and strenuous night climbs in Knoydart, where his only hope of escape lay in breaking across the tangle of peaks known as the Rough Bounds stretching between Loch Nevis and Loch Hourn, even to this day unspanned by any road. 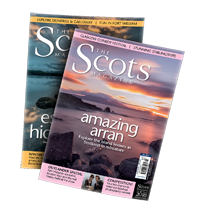 From Inverie superb cross-country rights-of-way lead through the hills to Barrisdale on Loch Hourn and Loch Arkaig via the head of Loch Nevis, not to mention lovely circuits nearer at hand to Airor and Inverguseran on the Sound of Sleat. Then from the tip of the peninsula you can return to Inverie by inland glens. After Inverie the loch swings south-east to Tarbert Bay. Now came the most interesting bit of the sail for me, through the river-like narrows to reach the inner loch, Kyles Knoydart to the north, Kyles Morar to the south, foreground to the great rampart of peaks whose roughness was to be Charlie’s saviour. Of these Sgurr na Ciche is the one that compelled the eve, soaring to a point and equal in grace to the best in Scotland. On the day of our sail, flotillas of cider drakes afloat on the water and sea-swallows flickering over the surface gave the feeling that Loch Nevis is a benign place—an impression given the lie shortly afterwards when we heard that two canoeists had drowned in storm-force gusts. In fact it is notoriously windy and we got a chilly reminder of it before we were back into the warmth of Mallaig. 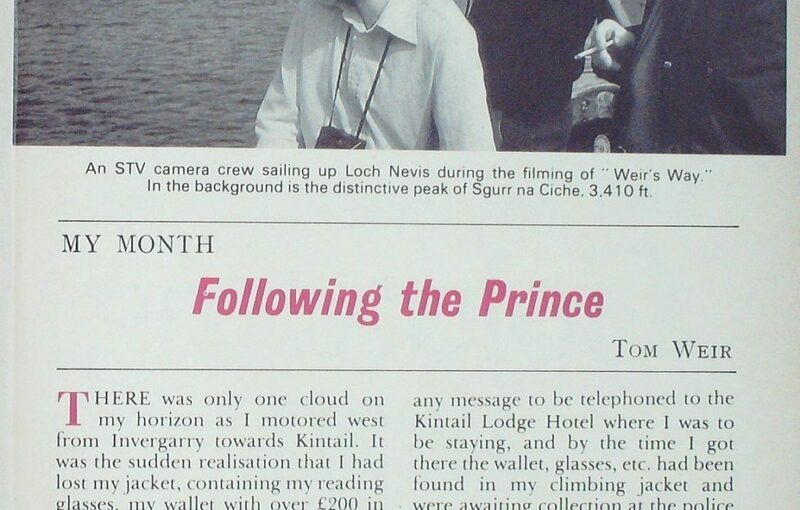 We were heading direct to Kintail because in April the camera team had traversed Loch Arkaig with me and walked through Glen Pean to Loch Morar where I told the story of Prince Charlie’s night climbs over the ridges to break the enemy cordon of troops watching for him. Then after a trying day lying close enough to the sentries to hear them talking, he made it under cover of darkness over the next ridge by the Bealach Duibh Leac into Glen Shiel. In Kintail I wanted to find the boulder which Charlie’s party of three MacDonalds with Donald Cameron of Glen Pean readied at three in the morning feeling weak from lack of food and tired with strain. I knew the stone was near the sheep farm of Achnangart, but I wouldn’t have found it without the help of the lithe young shepherd who pointed it out on the side of the steep gully a few hundred feel on the far side of the River Shiel on the slope of Sgurr na Ciste Duibhe. Our first problem was to get across the bouldery and fast descending river, which meant socks off, then boots back on again for the slippery crossing, for bare feel are lethal when you have 10 cope with stones of every shape, some of them razor sharp. From the glen you would never have known that the dark-faced stone which the shepherd had pointed out had a hollow under it, not particularly commodious, but with a superb outlook in all directions, so that you couldn’t be taken by surprise, except from above.